FBTBForums.net :: View topic - Lord Cornelius Skywalker's Steam Powered Speeder Bike FINAL! 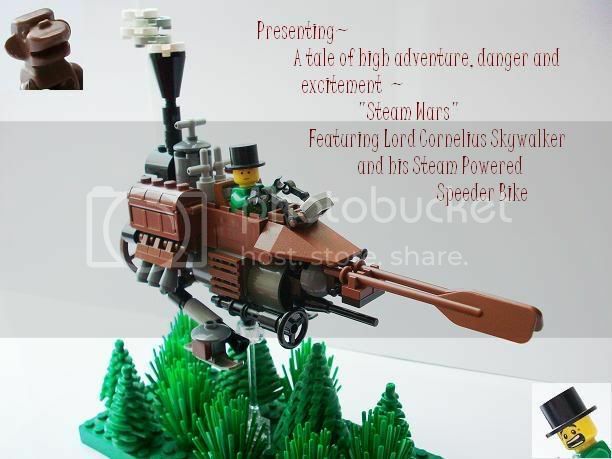 Lord Cornelius Skywalker's Steam Powered Speeder Bike FINAL! 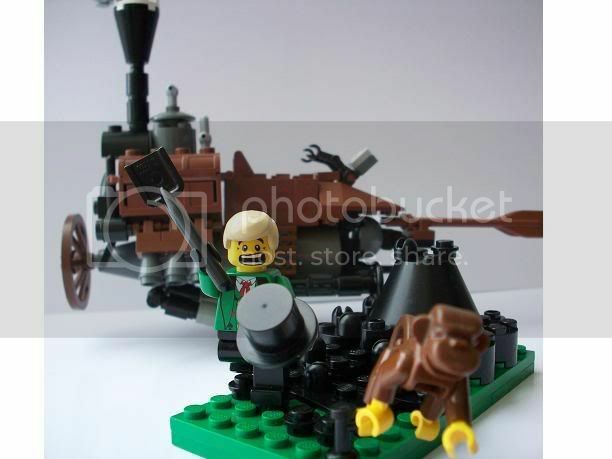 Posted: Sun Jan 13, 2008 12:21 pm Post subject: Lord Cornelius Skywalker's Steam Powered Speeder Bike FINAL! Fuelling up time! Oh, hello monkey. I couldn't resist the little story. The speeder now has a burner at the back. It's prety good, but looks almost nothing like a speeder bike. Well i have to be blunt that looks nothing like a speeder bike. On the plus side you got the steampunk part down really good and I like how you used the oars making it seam like an air boat. Thanks for reading this signature but you really shouldnt have cus its a useless waste of youre precious time. Lou, I love it. It is very Steamy and I can tell what it's supposed to be. If you put horizontal lines on that picture above and below the front oars, you can identify the bike. I think it's a great interpretation. As for being a speedbike, I don't know. For the creation though it looks great. Good job! It looks pretty good, but couldn't you make the nose a little bit longer, that it looks more like a speederbike? The two front paddles are a little bit too less, I think. Haha, that looks so ridiculously awesome! Good job! 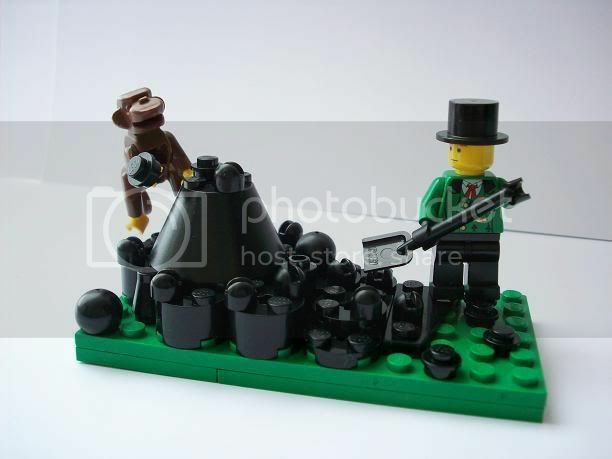 I like the whole diorama. I think that the steam speeder bike needs to be cut down. Have you tried making it small and making the noise longer and the tip fatter? A good start. Life is but a dream. Very nice Lou. It took me a second to recognize what this was based on but I figured it out. Aside from the contest, this is a great addition to the world of steampunkery. I love the triple cones on the sides. Are they exhaust or propulsion? 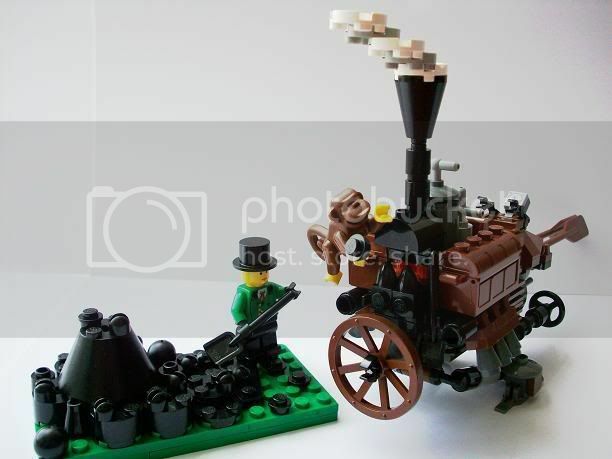 I wouldn't go so far as to say it's a good entry, but it's definitely a good steampunk MOC. It's got personality, and personality gos a long way. I think the biggest detriment to the model is the relative bulk compared to the Source. It's a great representation, but with the size, my mind keeps wanting to compare it to a snowspeeder more than a speederbike. I see the shape, but it goes too far "down." The biggest culprits are the oars and the wheels (along with the structure for the wheels). They break up the line of the model, and hides the bike aspect. But as Don said, great steampunkery there. I think it's a wonderful idea of a ship, it's just hard to see what ship. Thanks for the comments everyone, it is understandable that some are having difficulty seeing the Speeder Bike in amongst all that steam shenannigans. Perhaps a bit of explanation is required. Being a Cornish boy and unwilling to ignore my roots my initial thoughts were to be respectful to the great Cornish pioneer of steam locomotion, Richard Trevithick and the later and more famous Stephenson's Rocket. Edit: I should be shot for forgetting to mention William Murdoch's Flyer, I only drive past it most days! Thus, I decided I would incorporate a whopping boiler, hence the use of the dark grey engine, a wooden carriage and a substantial steam pipe. The parts that identify the machine as a speeder bike to me are the front oars and the shape of the wooden carriage including the chest at the rear. The rest is whimsical fancy, or some may say, a simple foray into the ridiculous. The boiler turned into a propellor driven torpedo/aircraft engine type thingy and provides forward momentum. The three cones provide the upward thrust, the steering oars are for, well, steering and also if used frantically can add extra oomph to the boiler pressure. The wheels are for landing and taking off but also give this machine land based capabilities on easy terrain. I should mention the steam pipe and smoke was inspired by Monsieur Rockeau and the cone thrusters were inspired by Shifto's Landspeeder. I take onboard all your comments, if i get time i'll try de-bulking it a bit and see if I like it. I have had great fun with this, it's funny, my wife gave me Jules Verne's classic '20,000 leagues under the sea' for christmas and so i was already feeling steampunky before the contest was announced, now i think i'm hooked on the genre full on . 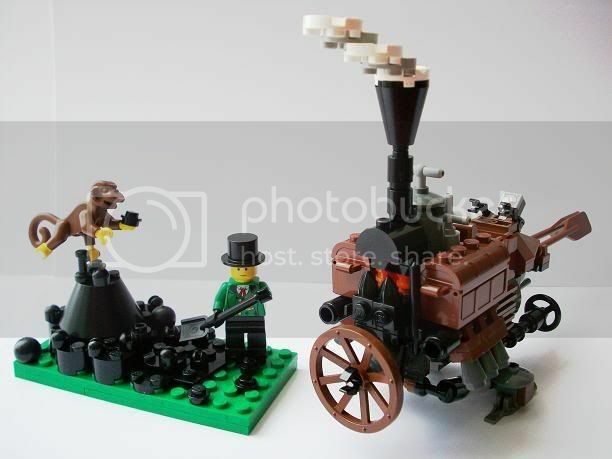 Edit: since i've updated my MOC it looks nothing like the early steam locomotives i've drawn attention to here, but if you are interested in the beginnings of steam powered locomotion you might find the links interesting so i'll leave it here. Relax Ducky dude, there's no need to be rude. There's a re-build on the way. It's obvious my original MOC splits opinion, some love it some don't like it at all. The explanation wasn't an attempt to persuade anyone that it looks like a speeder bike. I agree that as it turned out it's more of a Steampunk MOC, if you don't like it fair enough, but there's really no need to take the Michael. Just a reminder to keep criticism constructive in all of these posts. That means, if you're not going to give any tips/advice/feedback, don't post in the MOC section. Uhh...Exactly what was rude, I was simply giving advice??? sorry if you feel that way, it must be my way of coming across. I work for the Australian Government.... we are blunt and tell it like it is, but i certainly was not trying to be rude, sorry if it came across that way. Updated original post with new version pics. Version 2 is awesome! Great work dude! I don't know how it stays aloft, but thats part of the charm of Steampunk. and chunked it up a bit. This design would make a great drawing. Wow you really improved it alot. Now i can instantly tell its the speeder bike great job. Maybe it bounces on those legs - they look springy. Anyway, I echo the previous comments on the new version's recognizability, and the oars. I also like the psuedocamo touch given by Luke's green shirt. But I love V2. it looks realistic, functional, and adorable. I just might have to build something like this. V2 is much, much better. Definitely looks like a Steampunk-speeder. I think it looks a little fat, though, but I don't see how you'd change it without taking anything away from it. I'm all done guys, i hope you like it. As always any comments will be appreciated.